“What can be done about the state of classical music?” Lawrence Kramer asks in this elegant, sharply observed, and beautifully written extended essay. Classical music, whose demise has been predicted for at least a decade, has always had its staunch advocates, but in today’s media-saturated world there are real concerns about its viability. Why Classical Music Still Matters takes a forthright approach by engaging both skeptics and music lovers alike. In seven highly original chapters, Why Classical Music Still Matters affirms the value of classical music—defined as a body of nontheatrical music produced since the eighteenth century with the single aim of being listened to—by revealing what its values are: the specific beliefs, attitudes, and meanings that the music has supported in the past and which, Kramer believes, it can support in the future. Why Classical Music Still Matters also clears the air of old prejudices. 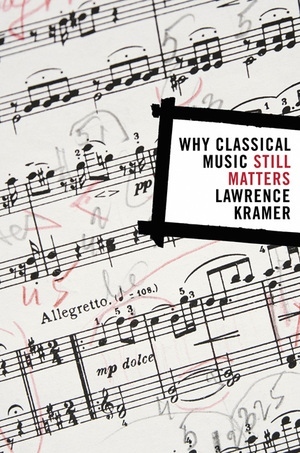 Unlike other apologists, whose defense of the music often depends on arguments about the corrupting influence of popular culture, Kramer admits that classical music needs a broader, more up-to-date rationale. He succeeds in engaging the reader by putting into words music’s complex relationship with individual human drives and larger social needs. In prose that is fresh, stimulating, and conversational, he explores the nature of subjectivity, the conquest of time and mortality, the harmonization of humanity and technology, the cultivation of attention, and the liberation of human energy. Lawrence Kramer is Professor of English and Music at Fordham University and editor of 19th-Century Music. His many books include Opera and Modern Culture: Wagner and Strauss (2004), Classical Music and Postmodern Knowledge (1995), After the Lovedeath: Sexual Violence and the Making of Culture (1997), and Musical Meaning: Toward a Critical History (2002), all from the University of California Press.